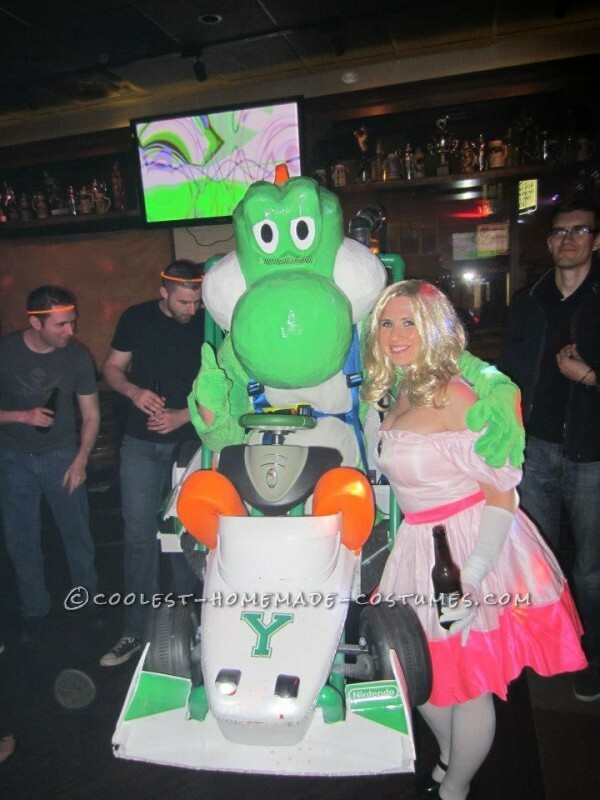 Amazing Yoshi Mario Kart Halloween Costume - Entirely Homemade! 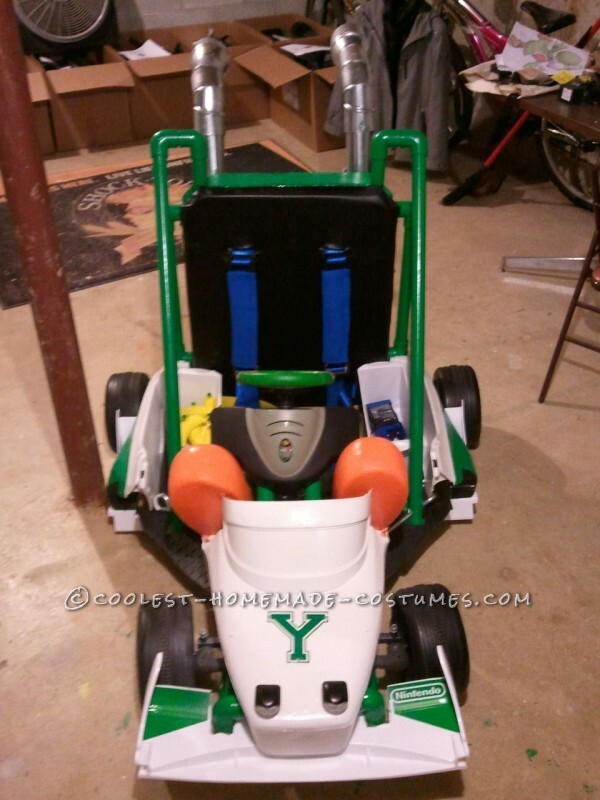 Amazing Yoshi Mario Kart Halloween Costume – Entirely Homemade! My costume for the Halloween 2013 this year was Yoshi Mario Kart from the popular Nintendo game series. Over the years since the game came out I have seen a few cardboard Mario Kart costumes, but never a full sized kart like featured in the game. I decided I would make two costumes in one this year a Yoshi suit and head along with the Mario Kart! The costume was designed to be a backpack that strapped to my shoulders. The hardest past with that particular design is making it light enough so you can stay in costume the whole night. The best part of the costume was seeing the crowd’s reaction when I walked into a room. I wore the costume out the Saturday before Halloween and as soon as I walked into the room people began cheering and laughing. I pretended to drive around the room moving the steering wheel left and right. The more I got into character the more people enjoyed the costume. If someone was in my way as I was walking, I would throw a banana at them and they would turn around and just smile and laugh. The costume was a little heavy but overall very manageable even when dancing. Every time I was on the dance floor people would run over and force me to dance with them. It was times like this I was extremely glad I put a fan into the nose of Yoshi to keep me cool. To add to the appeal of the costume I had my wife dress up as princess. At the end of the night when I was on stage for the costume contest I had her throw the star at me. Once I caught the star and flipped on the LED lights, the crowd went crazy for star power. The star power got me enough cheers to win the costume contest!! I barely beat a well made homemade Lego Man, Batman and Ironman. At the end of the night I was exhausted and only had one out of the ten bananas I brought with me left. I guess a few people got to keep a souvenir from my costume. Overall this was another amazing Halloween. I look forward to entering this contest each year and getting to see all the new costumes people submit. I included a link of more pictures and videos of the Yoshi Mario Kart costume in action. If anyone has any questions let me know and I will be glad to answer them. 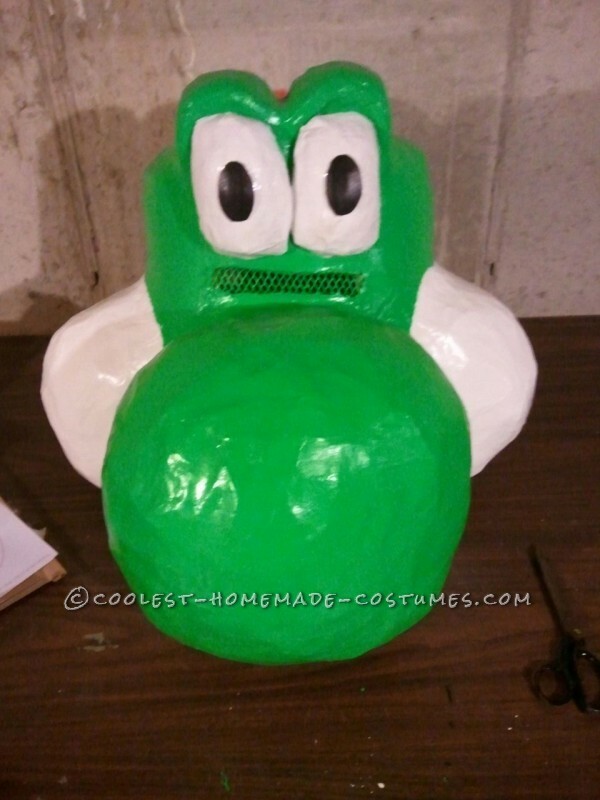 The first step in making the costume was the design of Yoshi’s head. I started with 12″ and 10″ cement tubes. The 12″ tube would be where my head went into and the 10″ tube would be used for the nose shape. 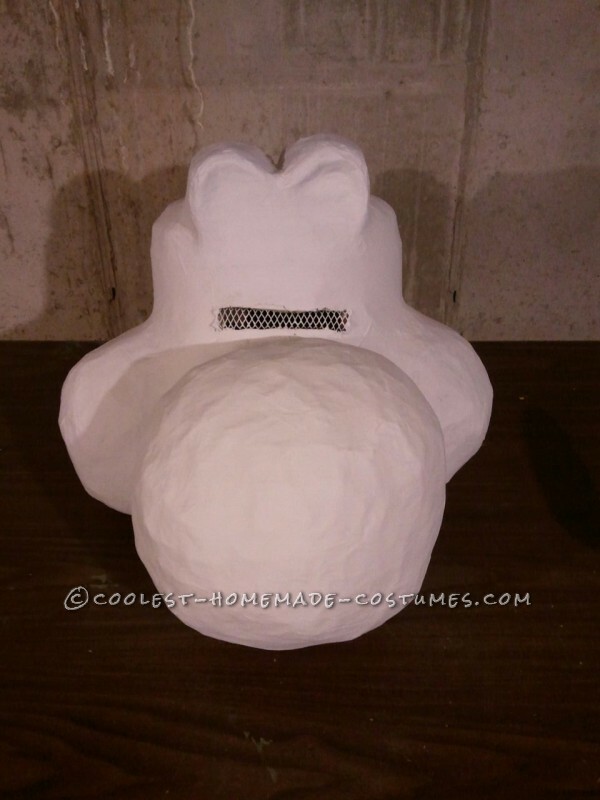 To cover the top of the head and the front of the nose I used 3″ insulation foam. 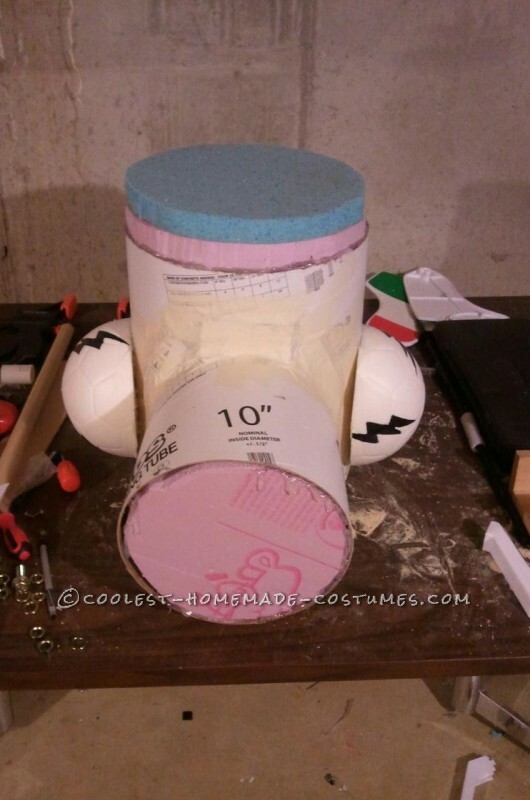 For the cheek design I cut a Styrofoam soccer ball in half and hot glued it down to the main head. Anyone who makes paper mache costumes knows that they can be very hot at times if you have to wear them all night. To help me solve this problem I bought a battery powered desk fan that would fit into the nose of Yoshi. 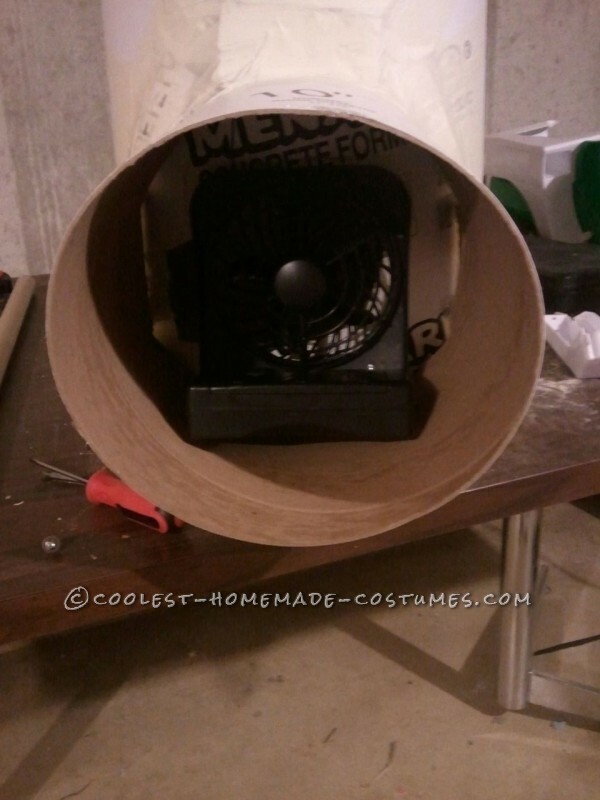 Once screwed into the head I cut a hole on the inside of the cement tube so that when the fan was on there would be a continuous breeze blowing on my face keeping me cool. I added two holes to the bottom of the nose so there would be an area for air to travel. Once I had the general shape of the head made it was time to paper mache and paint the head. To get the rounded shape of the nose and eye brows I used crumpled up newspaper and masking tape. To make sure the head was hard to the touch I added about 10 layers of paper mache. As the paper mache dried I used a white primer paint to seal the entire head. Once everything was dry, I added a medium sized eye opening in the head and covered it with a wire grate to hide my eyes better. When the head was dry I added eyes and horns to the head. Both were made out of Styrofoam insulation pieces. To make sure everything matched I first bought the fabric to make the Yoshi costume. Once I had the right color fabric I made sure the paint was made based off the color of the fabric. The main head was painted using white and green latex paint. Using a full body suit I sewed the green and white fabric to the top half of the suit in the Yoshi design. The bottom half was left black so my legs would not be as noticeable. The back of the suit was cut down the middle and I added Velcro so it could easily slip on and off. To make the hands I traced the outline of my hands and made the outline a half size bigger then my normal hands. I cut out the 4 hand traces and sewed them together to make two gloves. The only way the costume could function was to make the whole system operate like a backpack on my shoulders. 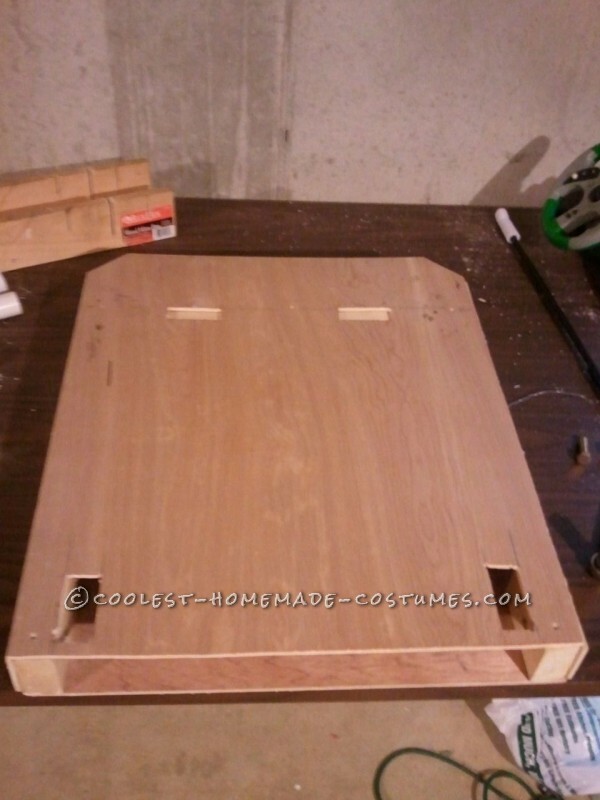 I constructed the backpack out of 1/8″ plywood and attached a racing harness for support. I added memory foam to the backpack and covered the front in fake black leather. The base of the Yoshi Mario Kart was made from 3/4″ PVC pipe. 1/2″ PVC pipe was not strong enough and 1″ pipe was too heavy. The PVC pipe went through the back of the backpack and was the main support spot for the whole costume. 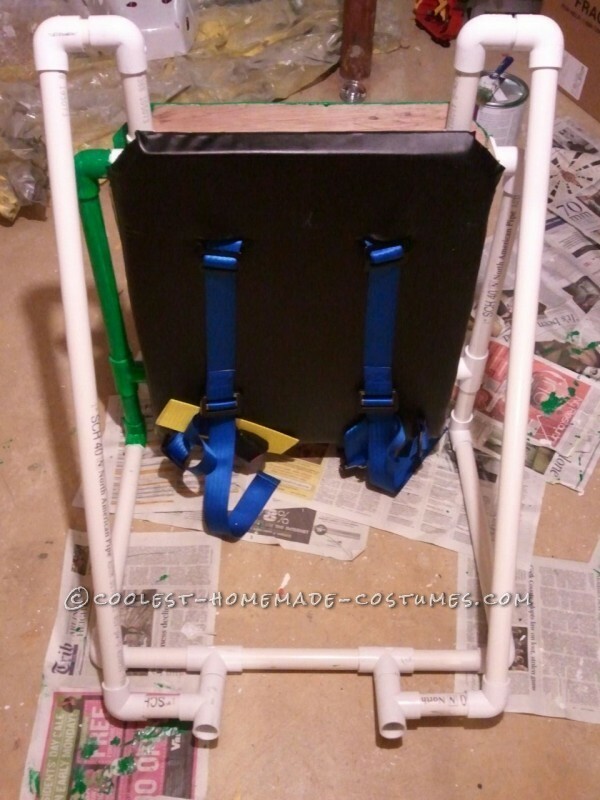 Inside the backpack was a 2×4 and the PVC pipe was screwed into the 2×4 with deck screws. 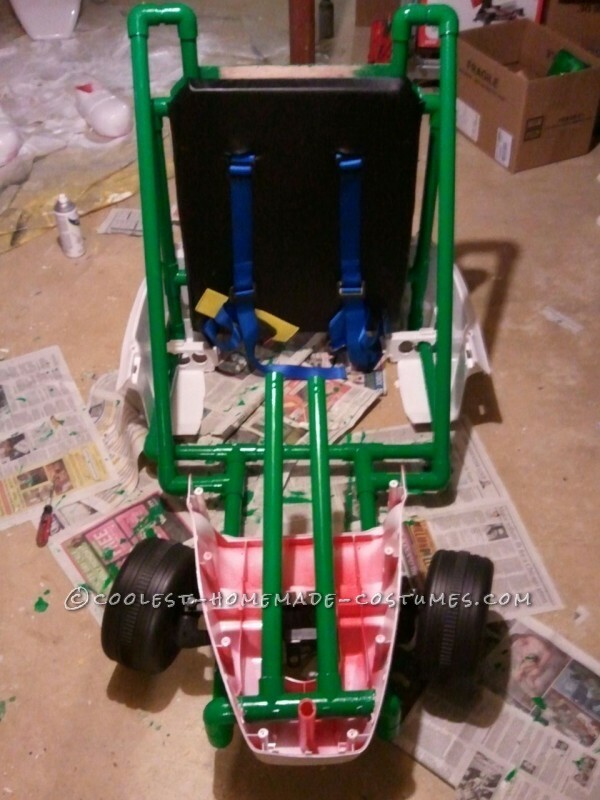 Once the out line of the kart was done I needed to add the main body parts. I was able to find a battery powered race car from the movie Cars that I cut down and turned into the kart. Once the main body parts were added it was time to add all the details to make it really pop! For head lights I used some bicycle lights. Yoshi’s feet were made from cut down clown shoes. The steering wheel was an old Xbox controller. I bought fake bananas to throw at people just like in the game. 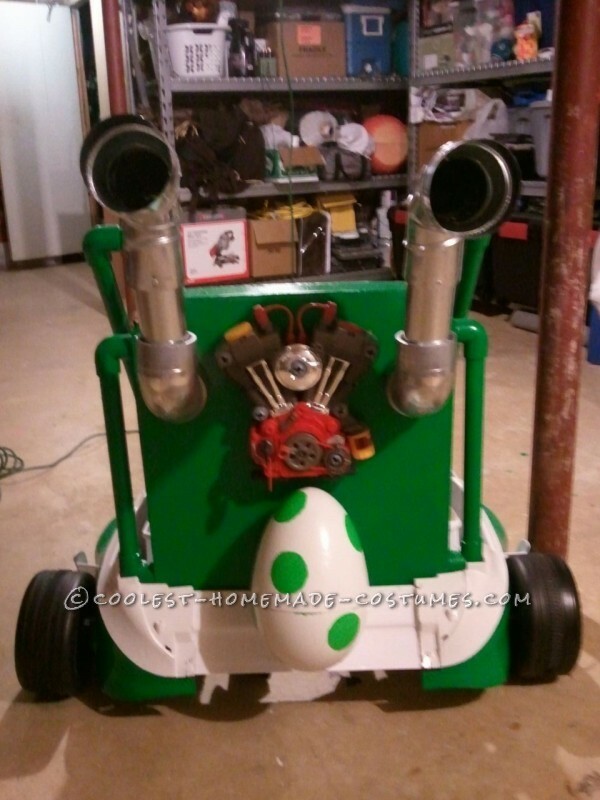 For the back of the kart I used air duct pipes for the exhaust system. I bought a fake toy motor that actually made sounds when you turned the key. The egg was an old Easter egg decoration painted to look like a dinosaur egg. The final addition to the costume was adding lights to make it look like Yoshi had star power. I added battery powered LED strip lights to the entire kart that could be activated with a flip of the switch. I even found a toy star that lit up.